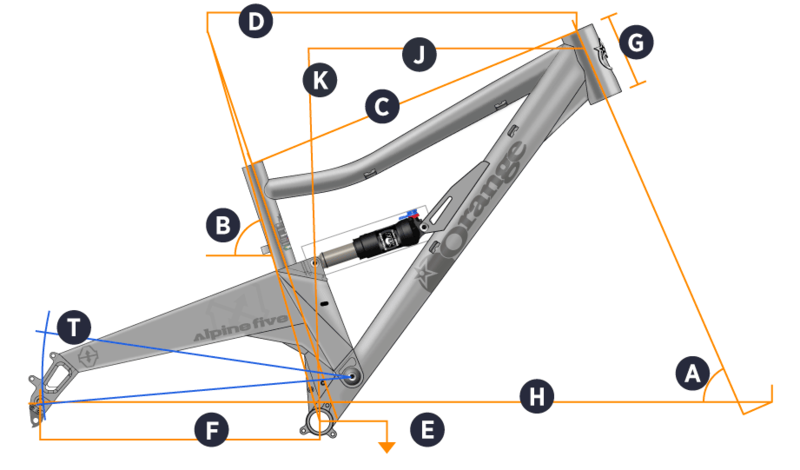 You can find the current Alpine Five Frame here. The Alps is a brutal place to ride. With trails that descend thousands of feet strewn with rocks, roots, drops, jumps, vertical chutes and blown out berms you need a bike that you can depend on, a bike that lets you thrive not just survive when the going gets hard. This is the thinking behind the Alpine Five. With its combination of 29inch wheels, 140mm of suspension and our trademark confidence inspiring geometry the Alpine Five is ready to take on anything you put in its way; the faster the better, whether that’s between the race tapes or up and down mountain trails. This is no straight-line monster truck though and its addiction to speed isn’t at the expense of handling when the going gets technical. Designed to handle anything the most demanding Alpine trail can throw at you twists and turns, rocks and drops are handled with equal ease whatever your velocity. The Alpine Five incorporates all the usual features you’d expect from a handbuilt in Halifax Orange. A single pivot removes complexity, adds reliability and leaves you to worry about the trail, not your maintenance regime. Our unique blend of monocoque and Reynolds tubing is mated to a 1.5inch headtube saving weight, adding stiffness and allowing for greater fork and headset options so you can make your Five truly yours. A 142mm slotted hub spacing couples increased rigidity with quicker wheel changes out on the trail. Why The Alpine Five Frame? The Hope seat clamp is machined from billet aluminium to match the rest of your Hope components and uses a hard-wearing brass seat for the QR lever pivot. The seat clamp collar is now a universal design, so you can convert your bolted collar to QR or QR collar to a bolted design. NB. The QR version does not come with bolt. Seat Tube Length 16 in. 17 in. 19 in. 21 in.